A few quick thoughts on Mnemonic Wall. 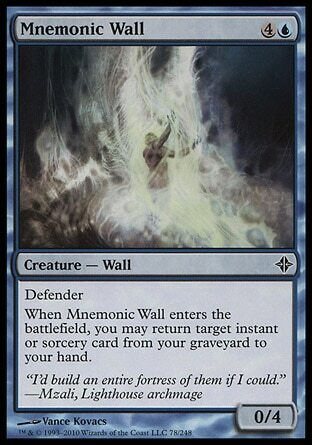 The other day, I compared Mnemonic Wall to Eternal Witness. While this comparison still applies, I can’t help but think that the Wall may be even better than I originally thought. Consider the applications of being able to clear the board with Day of Judgment against an aggro deck, then follow it up with Mnemonic Wall to simultaneously retrieve the Wrath from the graveyard AND put your opponent in a situation where they have to either a) play a creature that the Wall can’t profitably block, or b) overcommit to the Day of Judgment that’s now back in your hand. And lest we forget: It blocks! It blocks Bloodbraid Elves and Sprouting Thrinaxes, Kor Firewalkers and Nissa’s Chosen. It’s a great chump blocker to give you one more turn to replay that Wrath. It’s also one more permanent to sacrifice to any Annihilator Eldrazi that may somehow make their way onto the board (not that that’s a great reason to use it, but in a control deck that tends to have few nonland permanents, it’s something to keep in mind at least. Sometimes a land may be more important to keep around than an 0/4 wall). Of course, I’m not sure what else Rise of the Eldrazi has in store for us, but at the moment, Mnemonic Wall looks like an exciting, constructed-playable card that should at least make the short list when building any blue-based control deck. CURRENTLY READING: The Glass of Time by Michael Cox. 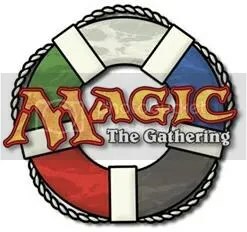 A short video montage of some footage I shot during the Magic Cruise, February 7-13, 2010. Enjoy! Be sure to check out the MC3 over at Legion Events!